Contemporary in style, with the convenience of modern functionality such as USB charging and power recline, the Hallstrung genuine leather furniture collection are perfect for outfitting your living room or entertainment space. Fashion-forward style. Sumptuous leather feel and appeal. Total comfort at your fingertips. It’s all yours for the taking with the Hallstrung power recliner with adjustable headrest. 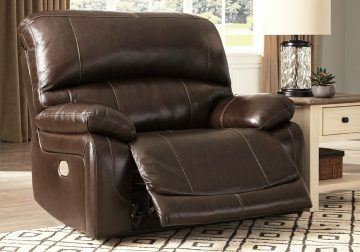 Wrapped in an attractive gray upholstery, this decidedly contemporary power recliner tantalizes the senses in so many ways. An Easy View™ power adjustable headrest allows you to lean back while propping up your head—perfect for chilling out in front of the TV—while an extended ottoman lets you stretch out all the more. And with a USB port in the power control panel, you hardly have to move a muscle to stay powered up. Frame constructions have been rigorously tested to simulate the home and transportation environments for improved durability. Components are secured with combinations of glue, blocks, interlocking panels and staples. Stripes and patterns are match cut. All fabrics are pre-approved for wearability and durability against AHFA standards. Cushions are constructed of low melt fiber wrapped over high quality foam. Features metal drop-in unitized seat box for strength and durability. The power reclining mechanism features infinite positions for comfort and a USB charging port in the control. 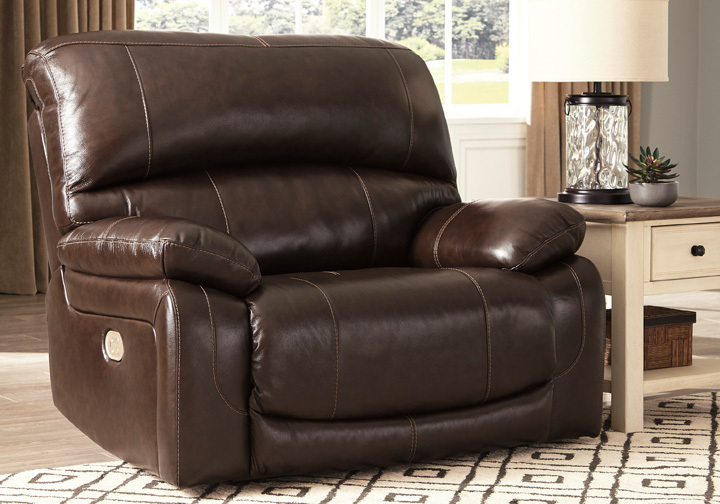 In addition, the style features a power adjustable head rest and Jumbo Stitching. Leather Match upholstery features top-grain leather in the seating areas with skillfully matched vinyl everywhere else.